The Night Café, by Vincent Van Gogh, painted in Arles in 1888. 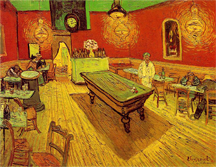 In the center of the painting is a billiard table. The object of one variation of the game, Carambole Billiards, is to strike the object ball with your own cue ball by caroming off your opponent's cue ball (and possibly three cushions). Strategically, it's desirable to leave your opponent's cue ball in a difficult position, should your own ball miss. The game was very popular in France at the time. Subject changing is a conversational technique for guiding shared thought in a mutually agreed direction. And like all tools, it has multiple purposes, some of which can be corrosive to collaboration. Understanding subject-changing helps us identify these sometimes-corrosive maneuvers, and helps us refrain from using them. Here's Part II of a catalog of techniques for changing the subject. See "Changing the Subject: I," Point Lookout for February 21, 2007, for more. Sometimes interviewers try to "pin" their interviewees. With each attack successfully evaded, the interviewer raises yet another issue, never acknowledging an escape. The interviewer's goal is to engender a feeling of frustrating impotence in the interviewee. This tactic is used in interrogation, cross-examination, and other hostile interviewing. It sometimes appears in performance reviews, when the determined supervisor tries to justify a negative review. Upon noticing the tactic, even if you're taken aback, do what you can to slow the pace and break the interviewer's rhythm. This pattern appears in problem-solving sessions, when someone excitedly offers a fresh insight, and especially when the blurter has been lost in thought. It's best to forgive these blurts, because they're often treasures of great value. to collaborationtactic also appears in intense arguments, when the blurter has lost self-control, and in other uncomfortable situations when the blurter is extremely stressed. Take these blurts as indicators of the need for a break. In this tactic, the subject-changer offers a contiguous comment, but then shifts the focus in a slightly different direction. Done artfully, other participants might not even notice the carom. The true artist changes the subject by posing a seemingly related question, the main purpose of which is to enroll the other participants in the shift. By answering, they implicitly agree to the new subject. Here X is the goal of the focal shift. The purpose of the question can be to draw the others into a discussion of X. Here the subject-changer might open with a contiguous "sealer" comment, and then suddenly shift to a new subject. A sealer comment is a final summary or assessment, such as, "We don't know enough to decide that now, so let's take it up tomorrow." The subsequent hijack often begins with "Moving on…" or "On a more urgent matter, …" That's probably your last opportunity to call attention to the tactic, or to steer back to the thread. Would you like to see your comments posted here? rbrenWdLuEBseRYtIBxrener@ChacHlcAlZhIbJusPWAEoCanyon.comSend me your comments by email, or by Web form. I offer email and telephone coaching at both corporate and individual rates. Contact Rick for details at rbrenOZlJJERMQpldAdIsner@ChachiXWfxQkcwyJKfaeoCanyon.com or (650) 787-6475, or toll-free in the continental US at (866) 378-5470.